Senior Danjuma Quarless received first place in the 2009 Scientific Poster Presentation this summer while participating in the University of Massachusetts Medical School Summer Research Fellowship Program. Recently, he also was accepted to present his research at the American Society of Cell Biology's annual conference, which will be held in San Diego this December. 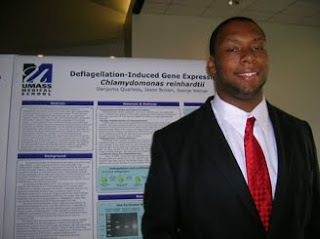 Quarless received the award from the University of Massachusetts for his research in deflagellation-induced gene expression in Chlamydomonas. Chlamydomonas is a type of green alga and unicellular flagellates. Flagellate are cells with one or more whip-like organelles called flagella, found in some animals. "My experience presenting in Boston paled in comparison to the experience of performing the research at UMass Med," says Quarless, who is a resident of Lakewood, Wash. "I was treated as a true grad school student and I carried a major portion of responsibility for the project, which forced me to step up to the plate and provided an opportunity for personal and professional growth." Funded by the National Institutes of Health, Quarless’s study examined the genetic regulation of flagella growth in the microbe Chlamydomonas. These are similar in structure and function to human cilia, which are cells that create a lashing movement, especially found in free unicellular organisms. Defects in human cilia are linked to kidney disease, male sterility, retinal degeneration and obesity. With help from the Whitman lab’s Jason Brown, Quarless developed an analysis that can be used to measure the extent of flagella gene expression in Chlamydomonas. All three judges gave Quarless perfect scores for the presentation of his poster in the categories of overall verbal skills, overall poster quality, effectiveness of the verbal presentation, effectiveness of the poster presentation, quality of work and organization. He took first place in the competition for the entire program as best overall poster, presentation, and experiment. "He is always one of the first students to ask an insightful question, and he is always engaged in the material," says Frank Caccavo, Whitworth professor of biology and Quarless's advisor. Caccavo adds that Quarless has been instrumental in the development of a new bioinformatics degree at Whitworth. The degree will combine the fields of biology and computer science. Quarless is majoring in mathematics with a concentration in bioinformatics. After graduating in May, Quarless plans to attend graduate school in the field of bioinformatics, mathematical biology or biomedical sciences. During his sophomore year, Quarless completed a study, "Comparing Beta-globin Gene Clusters Using a Fractal Geometry Visualization Tool." He teamed with Finn Pond, professor of biology, and Kent Jones, professor of mathematics and computer science, to compare human and chimpanzee DNA through a computer program created at Whitworth. Their goal was to create a computer program that could analyze and determine information about genetic sequences acquired from online sources, such as the National Institute for Biotechnology Information, Quarless says. Outside the lab, Quarless played football for two years and is in his third year as a member of Whitworth’s track and field team. He also is part of the fourth cadre of Act Six, a leadership and scholarship program that equips emerging urban leaders to engage in the college campus and their communities at home. Quarless served as a student representative for ASWU his junior year, and attended two of the national Act Six meetings. Frank Caccavo, professor of biology, Whitworth University, (509) 777-3454 or fcaccavo@whitworth.edu.